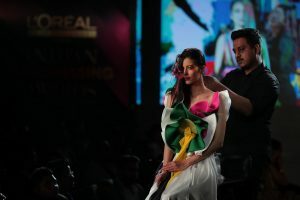 The second leg of the prestigious hair awards by L’Oreal Professionnel – Indian Hairdressing Awards – took place in New Delhi. After a successful run in the South, the Indian Hairdressing Awards by L’Oreal Professionnel moved to New Delhi for its North Region finals. Hairdressers from North India competed for an entry into the coveted grand finale. Various categories for the competition comprised Colour Trophy, Cut & Style, Young Colourist and Men’s Image. The IHA 2018-19 North Region Final witnessed participation from 36 teams. Participants recreated the hair looks live before a panel of judges. The panel included prominent celebrity hairstylist Aalim Hakim – Owner & Creative Director, Hakim’s Aalim; Edward Lalrempuia, Fashion Director, Harper’s Bazaar’ celebrated stylist Vivek Karunakaran, Edward Mendonca and Yatan Ahluwalia, Founding Partners & Directors – Y&E Consultancy & Services , and award winning fashion photographer Saurabh Dua. Speaking at the event, Binaifer Pardiwalla – General Manager, L’Oréal Professionnel India, spoke about L’Oreal Professionnel’s efforts for the betterment of the industry and the digital innovations that they will be bringing to the market. The show ended with the announcement of the winners of the IHA 2018-19 North Region Finals. Watch this space for more updates about the IHA East and West Region Finals.